[% 12025 | | Norwegian %] is offering a four-day sale this week and a two-day sale next week. 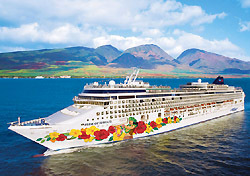 Deals include discounts on select cruises, upgrades, and reduced deposits. Through November 29, you’ll find inside cabins from $249 and outside cabins from $349 on select Caribbean cruises and outside cabins from $499 on select Hawaii sailings. You can also upgrade from an outside to a balcony cabin for only $50 per person. The discounted voyages are December itineraries, so you must be able to travel soon to take advantage of this deal. If you can’t travel next month, anyone who books a cruise departing between February 15 and December 31, 2008, will pay a reduced deposit of only $100 per person. For more information, visit Norwegian’s sale page. To access any of these deals, you must book by Thursday and request promotion code PGSQ4. All offers are capacity controlled, subject to availability, and may be withdrawn at any time. The lowest fares are “guarantee rates,” meaning that Norwegian reserves the right to assign you to any stateroom within the category you book. Another similar sale will be held on December 5 and 6. Check Norwegian’s website for specific deals next week.